Business to Consumer (B2C) companies are common and, therefore, competitive. As an entrepreneur starting up your own B2C business, you need the right tools to knock out your competition. This is especially true when your competitors have already been in the business game for years. They have already begun profiting from what offline and online business ventures offer. Fortunately, you can still win over consumers with the right B2C software. To learn how to find the right software, read on. You will discover the top B2C software must-haves for startups. When it comes to B2C marketing software, look for a system that offers automated emails. Your startup can earn a positive reputation right from the start with effective, error-free marketing tools. Your competitors are utilizing marketing automation tools, which suggests that you should as well. Consumers check their emails daily. Therefore, they are likely to see your email sitting in their inbox in a timely manner. Email consumers at the beginning of your startup with compelling messages to persuade them to purchase your products. Send them time-sensitive deals for being a returning customer once you have created a customer base. Successful businesses also use email automation to inform customers when their orders have been shipped. The tool can be used as a marketing and customer service tool. Invest in a B2C software system with email automation for your startup. Another must-have tool to look for in B2C software is customer tracking. 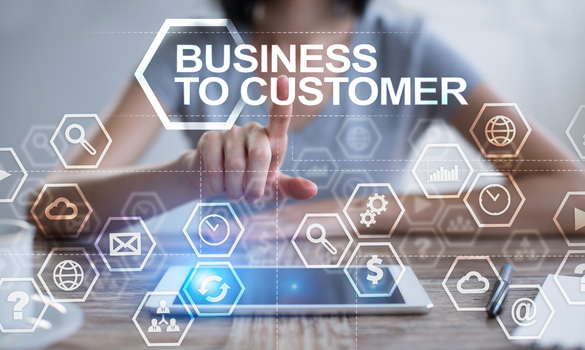 In order to build and maintain an efficient customer relationship management process, you need a system that allows you to keep track of your sales. You should also use software that documents customers’ sales journeys. Such documentation can benefit you and your new business in numerous ways. If a customer reports that they have not received their package when they should have, you can search through the data your system stored to figure out what happened. Then, you can solve the problem quickly and increase your customer satisfaction rate. Look for a system that offers customer tracking before starting up your business. That way, you can ensure that any problems can be solved immediately. As a result, consumers will get a good impression of your business right from the start. A multi-language feature is advantageous for B2C businesses as well. Although you are just starting up your business now, consider all of the customers you aim to reach. You will not be able to expand your business to customers in other countries if those customers are unable to read your product information. Furthermore, you cannot reach consumers who speak a different language in your own country either. Solve this issue with a B2C software system that offers multi-language options. Additionally, custom help portals enhance customer service for B2C businesses. The best portals include a Help Center, support email addresses, and other media channels that provide customer support. The more customer service tools a portal offers, the better name you will build for your brand. As a startup business, consumers are likely to have a lot of questions. Questions can be about your products, your services, or your company in general. To successfully start an online store, you must be able to answer these questions. Ensure ultimate customer satisfaction by purchasing a B2C software system with customizable help portals. Lastly, find a B2C software system that allows for artificial intelligence experiences. Consumers respond well to businesses when they utilize artificial intelligence. They engage more with such experiences because they feel more personalized to them. Your potential-customers desire connections. They want to feel like the company they are buying products from gets them. One way to ensure that you are that company is through AI. A great way to implement AI experiences for your startup is through a mobile app. You can begin building mobile apps without any experience. Keep your on-the-go audience in mind during the startup process as well. After all, many of today’s consumers shop online on their mobile devices. Adequately reach all possible audiences with AI integration. Use your competition to drive you toward the best B2C software. With the top tools, you can overcome your competition and gain a vast customer base for your startup. Firstly, look for an email automation feature to promote time-sensitive deals and provide clear information on your products. Customer tracking allows you to build and maintain an optimal customer service team. A system with multi-language features sets you up for reaching audiences all over the world in the future. Custom help portals can guarantee customer satisfaction. Finally, consider the benefits AI experiences offer to B2C businesses. You now know the top B2C software must-haves for your startup.